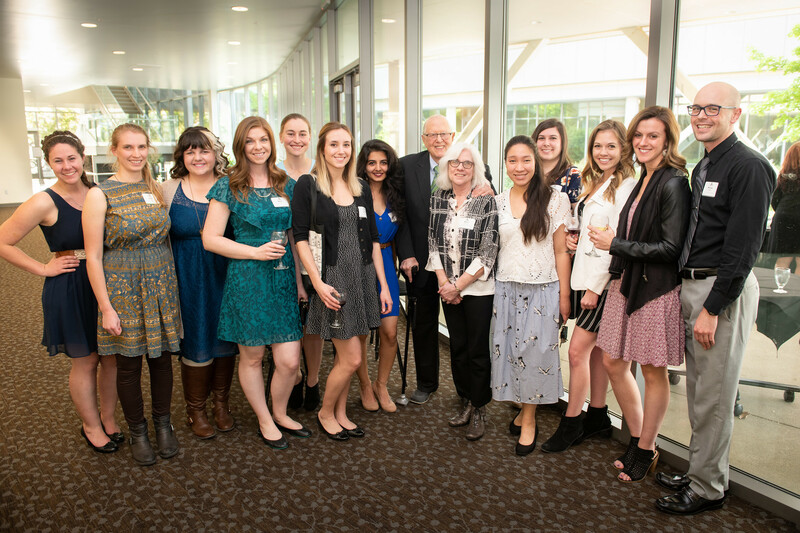 This month we celebrate the impact of scholarships for our students at our annual “Evening of Gratitude” event. This special night brings together our generous donors and friends with those most impacted by their acts of giving, our students. It is often an emotional night measured in the many conversations and smiles when those that give get a chance to see how their resources have changed the lives of our students. In turn, our students tell their stories to our donors and express directly to them how much their scholarships have helped them in their journey. Over the years, I am proud of our efforts to provide scholarships and grants to our students. We recently celebrated another successful Give Day and raised scholarship funds through events like the famous Doxie Derby. We lead the nation among all veterinary institutions in the amount of scholarships and grants provided to our students, this year approximately $7 million dollars. As a result of our efforts, our veterinary student’s debt load is well below the national average. Lower debt for our students means less stress for them to pay back their educational loans, but also allows them to consider careers based upon their passions versus altering their plans based on the need to pay back excessive student loans. 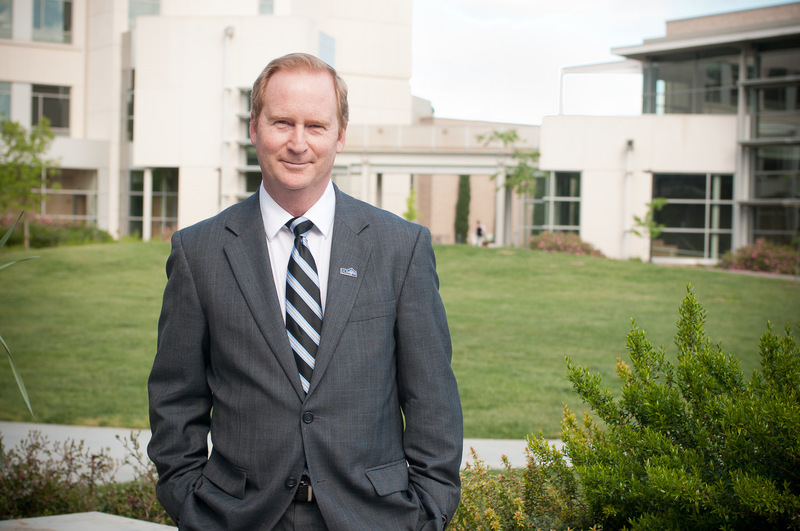 Dean Michael Lairmore assumes role of President of AAVMC in March. This week I have the distinct privilege to be appointed as President of the American Association of Veterinary Medical Colleges (AAVMC), during the association’s annual conference in Washington, D.C. The conference will focus on “The Science of Building Inclusive Teams,” to promote more effective group decision-making and organizational development. The mission of the AAVMC is parallel to the School’s mission, through the promotion of health of people, animals and the environment by advancing the profession and the education of veterinary students to meet the needs of a changing world. 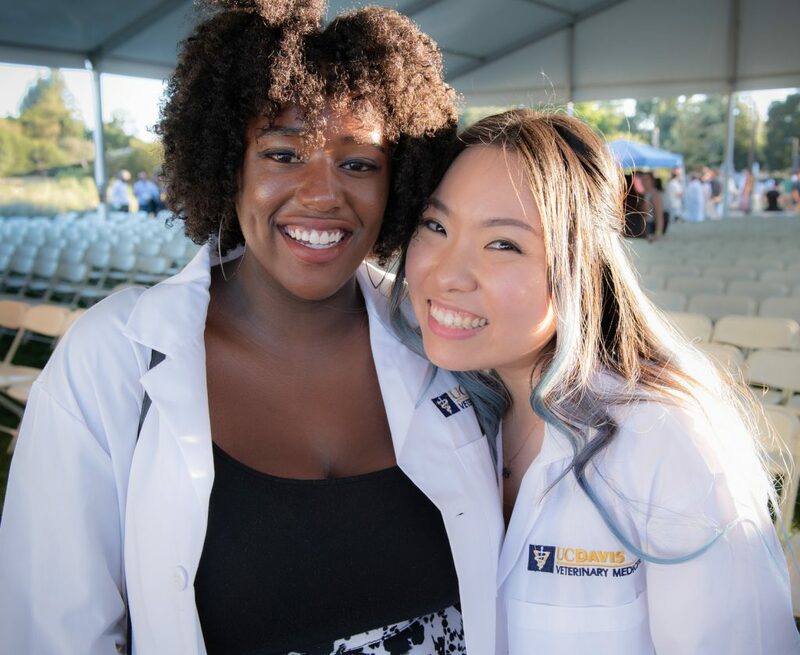 In assuming a leadership position in this organization, I am proud to represent the values, aspirations, and goals of our School beyond UC Davis. The month of February has special meaning to many of us because of the celebrations surrounding Valentine’s Day. It is a day that has evolved over time beyond romantic love to include expressions of love in many forms. For our School we have the great privilege of observing the love of animals on a daily basis, as we celebrate the human-animal bond. I have found that a good way to open conversations is to ask people if they have pets or if they are a pet parent. Typically, this question leads to favorite stories of how animals have touched their emotions or influenced their lives. Animals can bring out the truest forms of love in people, evoking the best versions of our humanity. 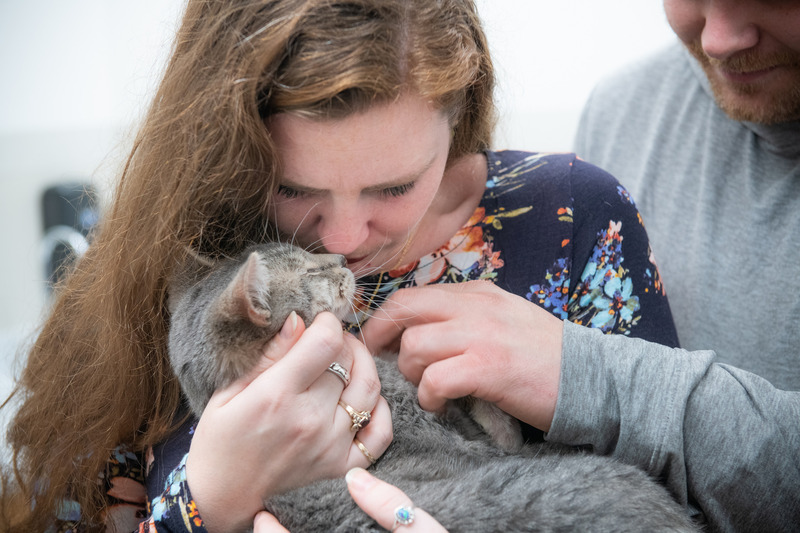 Our interactions with animals have demonstrable benefits in promoting healthy lifestyles and in supporting those with mental and physical disabilities. It is no surprise that our society has continued to embrace the human-animal bond in these turbulent and strident times. We seek from animals what at times seems unavailable from humans: unconditional love and boundless forgiveness. The holiday season marks not only a joyous time to celebrate the past year, but the beginning of a new year with all of its promise and hopes for the future. 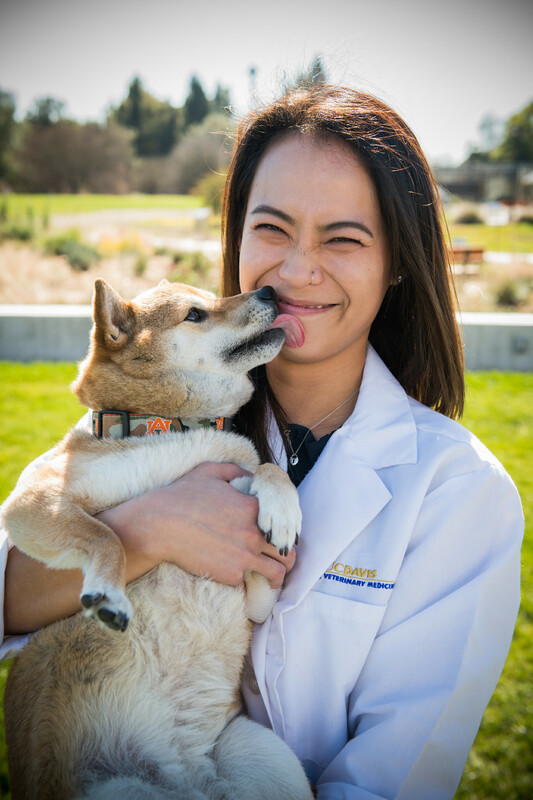 For UC Davis Veterinary Medicine, the past year has been a mixture of tremendous accomplishments and extreme sadness. We have opened new avenues to understand diseases that impact our society and battled disasters in our backyard. Our teachers inspired a new generation of students and learned from them in the process. The contrasts are striking between the extreme optimism of the next generation we are privileged to teach, and the problems we struggle with on a daily basis. Our plans are made and then disrupted by the reality of the constantly changing world around us. While our beliefs are strong, we are shaken by the stark reality that our democracy faces unprecedented challenges from those who believe scientific facts are a matter of belief versus sound principles of inquiry. As we look to the future we are reminded how connected the world is and how events are part of an interwoven story that connects us to each other and the natural world. As we envision the future, we are reminded of that connection. Our School is in a privileged position to influence the health of animals and people, while understanding the connections we all have with the environment we must share. 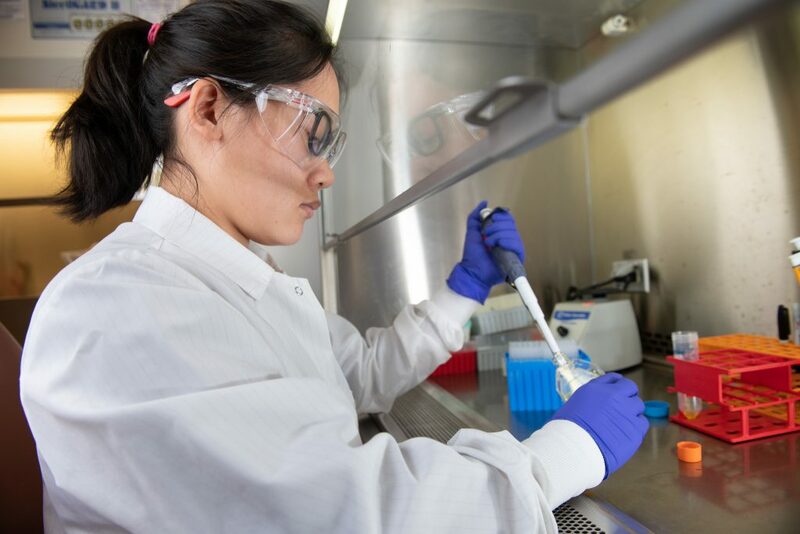 Our scientists have unraveled the hidden sources of possible future pandemics and uncovered new treatments for diseases that plague us. We are building new centers that will transform our approach to veterinary medicine and bring transdisciplinary approaches to unravel the complexity of life’s processes and stimulate our students to be lifelong learners. Into the uncertainty of the future, we have created a new strategic plan to address our core mission and reinforce our shared values. Our global leadership position in veterinary sciences and the education of the next generation of veterinarians and scientists means we must face this responsibility by bringing our talents, ideas, and passion to our work on a daily basis. I am constantly motivated by our collective strength to face our challenges and move forward to help our animal patients, create new knowledge of how life works, and inspire the creativity of our students. We share a common vision to advance the health of animals, people, and the planet. This unique responsibility will light our way and lead us towards the future. As the year of 2018 comes to a close, it is a good time to celebrate our accomplishments. For the school, this past year was a time of innovations and discoveries in multiple areas of our mission—from basic science to community building. DVM students welcomed into our Class of 2022. We welcomed a diverse incoming class of students who are academically gifted and prepared to serve in our global society. They joined and strengthened a community united by our common sense of purpose to serve society. Talented teams of researchers, clinicians, students, and staff used novel techniques and approaches. They advanced new treatments and helped answer fundamental questions to explain our world and advance the health of animals, people, and our planet. 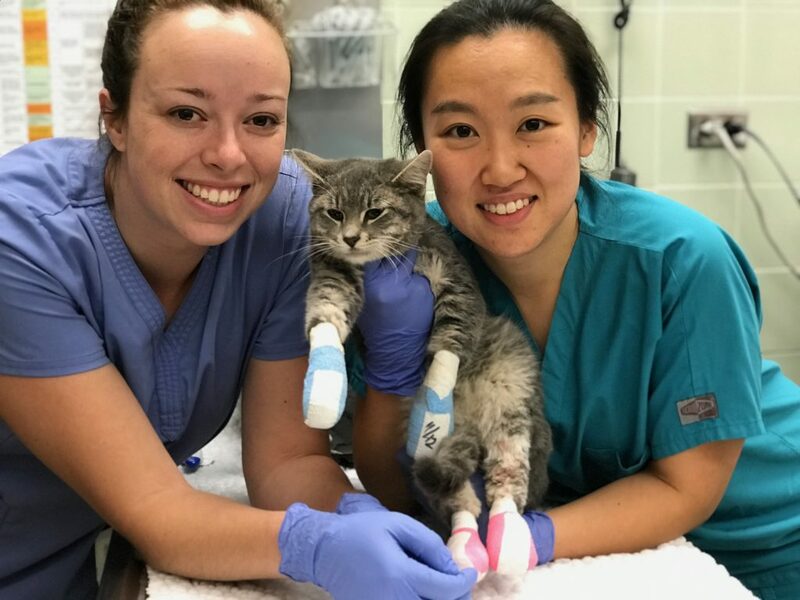 Galen Groff, a 3rd year DVM student, and Dr. Karen Park, a surgical resident, finish bandaging one of the cats rescued from the Camp Fire. He was later identified as Mayson and reunited with his owner. As we look skyward through the gray smoke that hovers over us, waiting for the winter rains, it is a good time to reflect on the blessings around us each day. A holiday to express gratitude following the deadly California fires over the past several weeks is both timely and healing. From tragedy comes hope as we observe all those who came to help the animals and people affected by the fire. 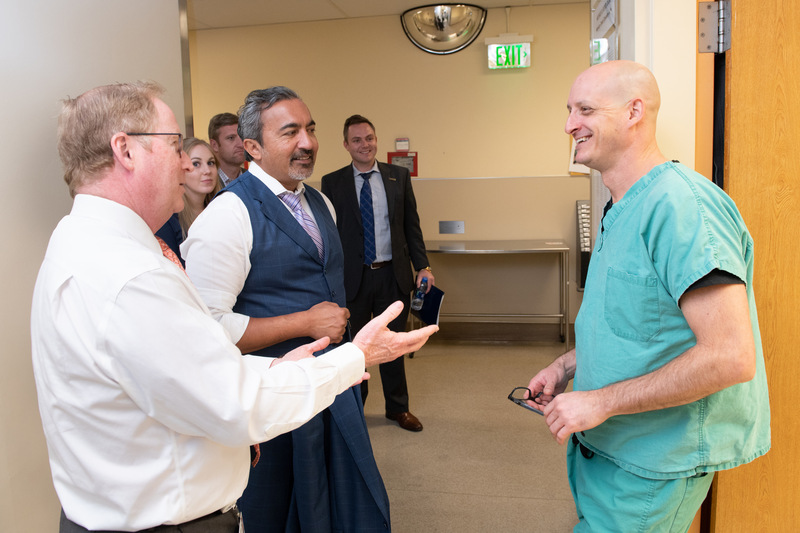 The recently completed 5th Annual One Health Symposium, focused on “Resilient Solutions for Growing Populations,” was a vivid example of how our community comes together to focus on the health of animals, people, and the environment. The symposium brought together veterinarians (faculty, alumni, and invited speakers), veterinary and medical students, staff, as well as physicians, public health officials, and other scientists promoting diverse networking opportunities and transdisciplinary approaches to one health. 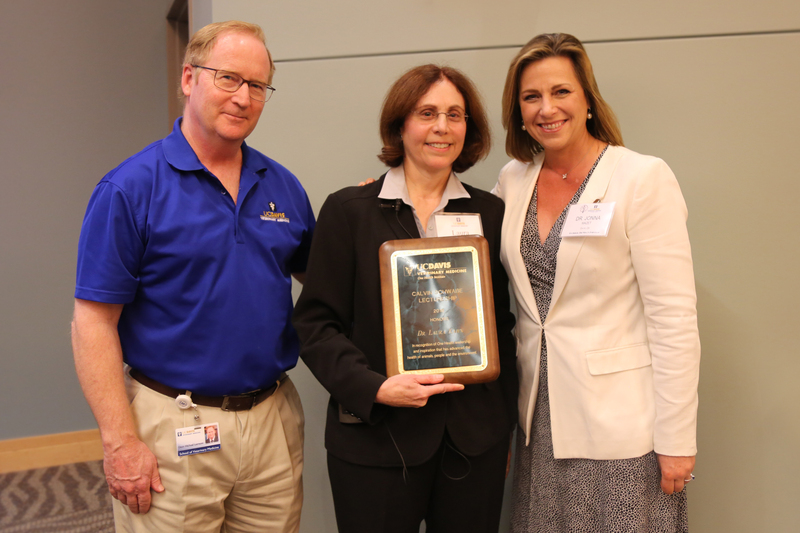 Dean Michael Lairmore with Dr. Laura Kahn (center) and Dr. Jonna Mazet. Dr. Laura Kahn, a world-renowned physician and research scholar served to frame the issues of the day and to honor, with her lecture, legendary former faculty member, Dr. Calvin Schwabe. Dr. Kahn highlighted the global challenges in food production in the 21st century, including policy and social issues that serve as barriers to progress. Her talk served to demonstrate the sobering facts of planetary concerns such as climate change, and outlined what will be needed to find solutions for the future. We recently hosted the combined Fall Festival and Alumni Reunion allowing us to welcome back our alumni to celebrate their memories of their time with us, their life accomplishments since graduation, and their contributions to the legacy of our school. The gathering featured major milestones for our alumni highlighted by events focused on the 50th and 60th reunions of the Classes of 1968 and 1958, respectively. During our traditional Rose Ceremony, we took time to focus on the Class of 1968 celebrating their 50th anniversary, in a poignant and heartwarming affair in which classmates shared stories, both humorous and touching, about themselves and those that have been lost over the years. 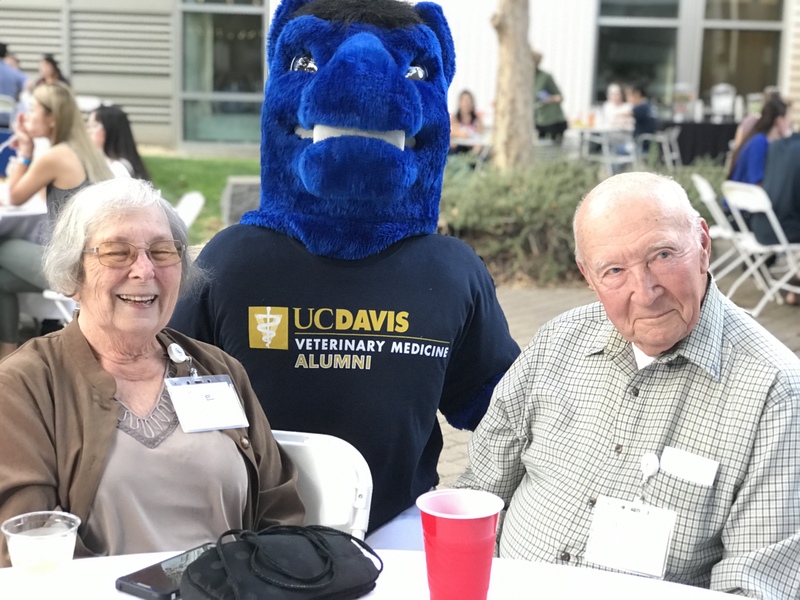 I was particularly impressed by our Friday evening festivities, kicked off with special appearances by Gunrock (the UC Davis mascot) and an energetic performance by the UC Davis marching “Band-uh,” while alumni and current students enjoyed a BBQ dinner. 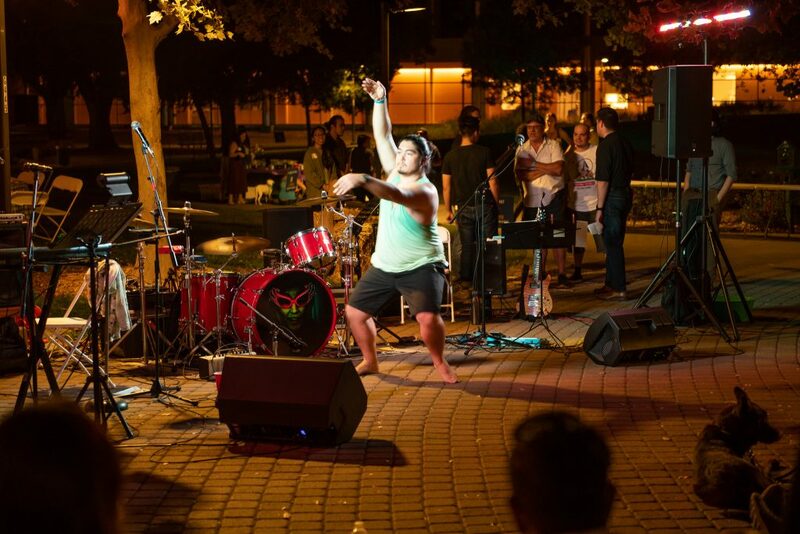 After entertainment by the Uncovered band (comprised of several of our talented staff), current students took part in a talent show. Their singing, dancing, instrumental playing, and spirit overwhelmed many of our alumni who were impressed by our students’ energy, maturity, and talent. Dean Michael Lairmore presents Dr. Ashley Hill an award for her work with the Masters of Preventative Medicine Program. A major event that highlights the beginning of our academic year is our annual Fall Faculty Reception where we honor faculty members with awards for excellence in teaching and research. Our faculty include some of the most talented individuals in their discipline. 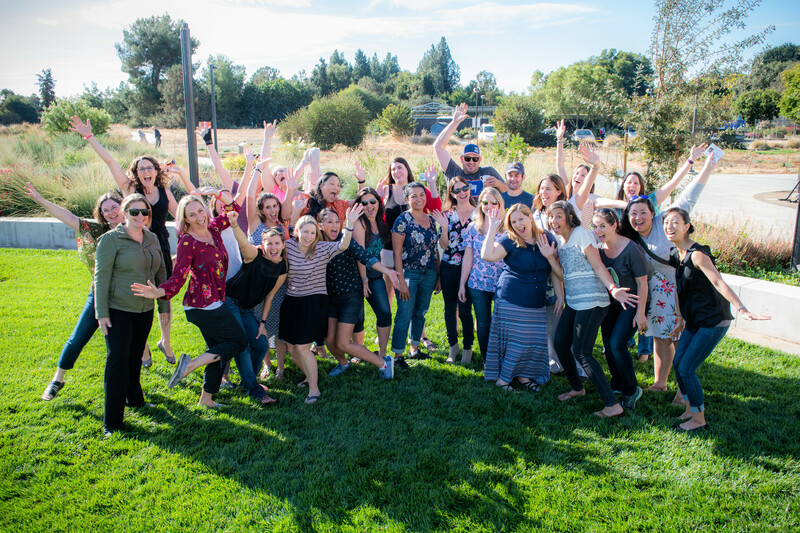 They are accomplished educators and researchers who strive on a daily basis to bring their talents, work ethic, and innovations to accomplish our academic mission in teaching, research, and service to our communities. 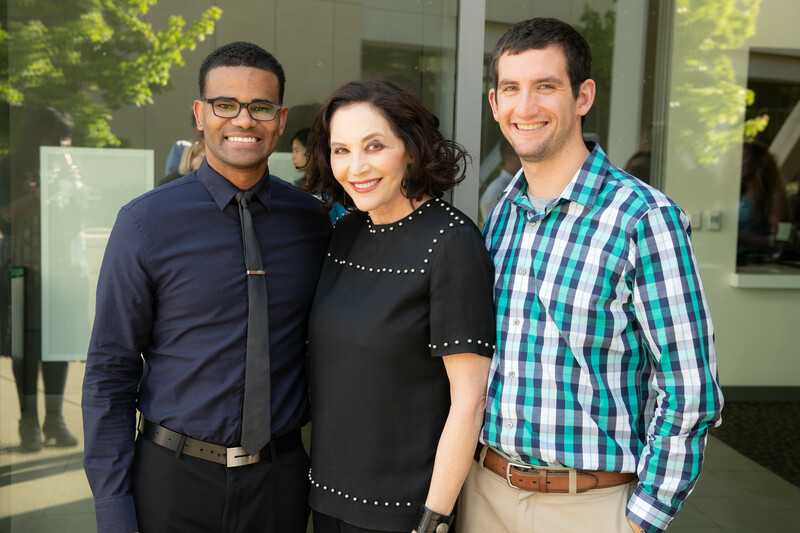 Our faculty are nationally and internationally recognized as leaders in their professional fields, therefore it is appropriate for us to recognize some of our best and brightest during our annual reception. 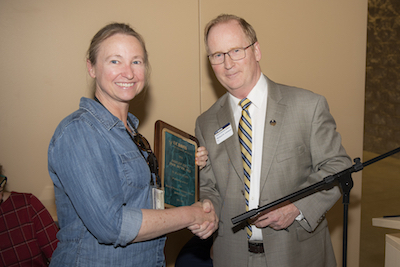 Dr. Joie Watson presents Dr. Stephan McSorley the 2018 Zoetis Distinguished Veterinary Teaching Award. 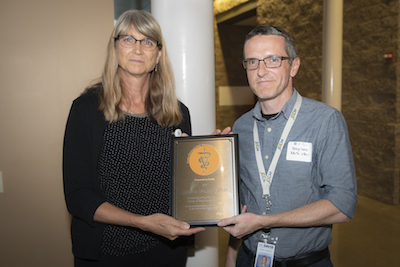 Dr. Stephen McSorley was honored with the Zoetis Distinguished Veterinary Teacher Award for his excellence in teaching immunology and microbiology and for outstanding block teaching leadership. His students consistently comment on his efforts to make a complicated topic more manageable, using a “road map” to organize lecture material that includes superhero references. 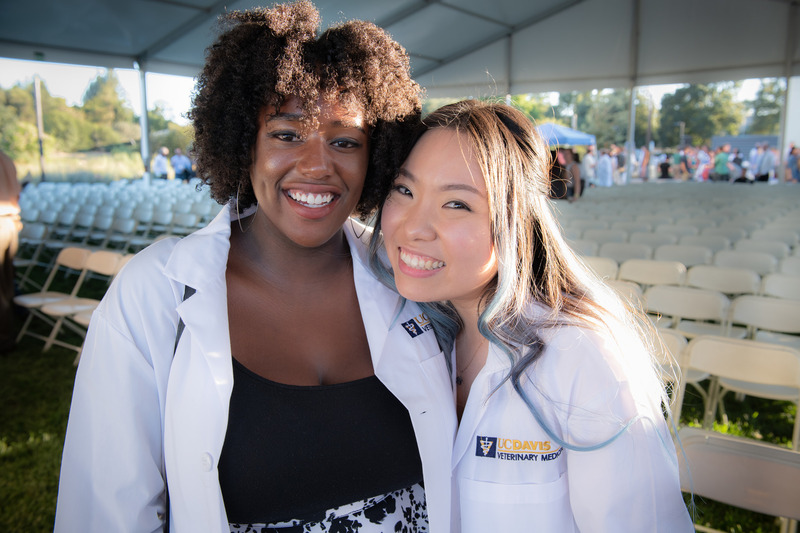 Our recent induction ceremony for the veterinary class of 2022 was a celebration of new beginnings and the fulfillment of dreams. The event represented an academic and career milestone for our new students. 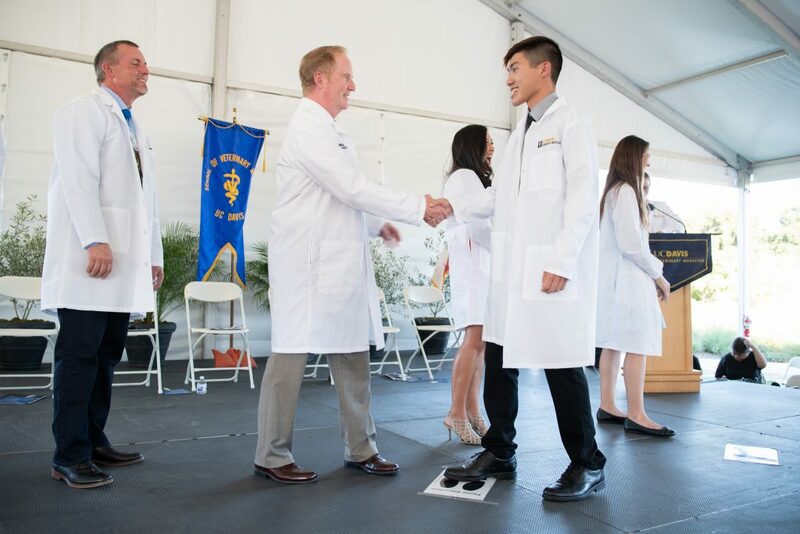 Their nervousness and joy was on full display as each walked across the stage to put on the white coat, a symbol of entrance into their professional lives and a first step toward their goal of becoming a veterinarian. The academic cycle is one of constant renewal as each new class of students comes to us to learn the knowledge and skills that will launch them into the world. Our new class of veterinary students, like so many before them, comes to us with their own histories, talents, and dreams. Each of them has their own story to share with us. As we teach them, they will impact our lives, adding to our own tapestry of experiences.